Looking for Summer: Time for a..
Paul Hickman and the Urban Ashes team. We wanted more of the details of the success behind Urban Ashes, so we went right to Hickman to get the full story. How did the evolution happen—from his early career in signage and graphics move to furniture designer, and then transitioning again into founding a company that has become a spirited partner in the revitalization of one of America’s iconic cities? And what inspiration from his story can we incorporate into our own lives and businesses? ABN: Tell us about the concept behind Urban Ashes—where it started and how it has evolved. Paul Hickman: I started my career as a sign painter when I was 15 and after college continued for the next 16 years working with toxic and environmentally degrading materials. I knew I had to make a change for a safer environment, not only for my health but also for anyone that would be part of that environment. I transitioned into furniture design and did a stint at EcoTimber in Berkeley, CA. There I realized there were more environmentally conscious alternatives, such as urban salvaged wood and other sustainable woods. And that was the beginning for starting my own art and furniture design services firm in Michigan, striving to utilize these woods and other green resources. But I wanted to design a product that would increase the utilization of urban salvaged wood while drawing from Michigan’s transitional or disabled workforce. We were making prints, framing them and selling them. 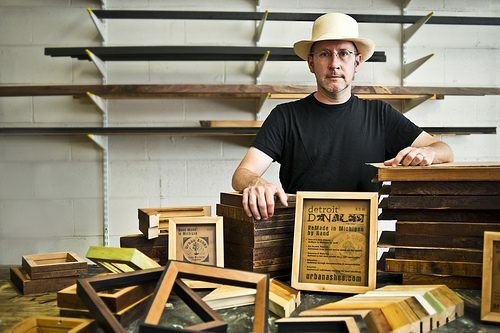 And then I realized the frames we needed could be made from urban woods and I could engage the state’s under-utilized workforce to make them. 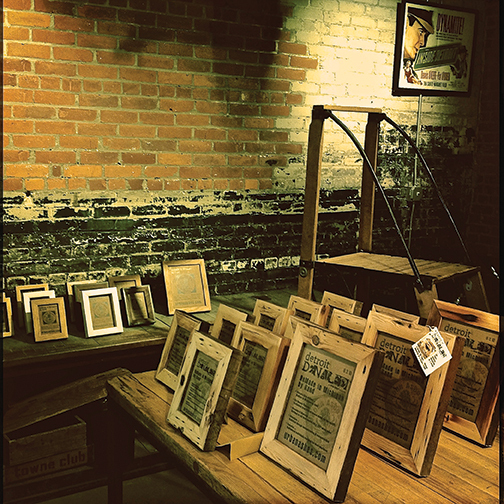 From this, a whole new line of picture frames was created to add to the furniture business and Urban Ashes was formed. ABN: Describe how the wood for your products is found. Are the materials reused, recycled, reclaimed? PH: Urban Ashes is built upon an extensive network of supply chains, ranging from urban salvaged wood sourced through our mill to trees individually salvaged from home owners, businesses and municipalities. We have built a name that these various entities recognize and they choose to contact us for several reasons. One, it often saves the person or entity responsible for the removal of the downed tree the removal and disposal fees, which can be very costly. It also allows them to know that they helped facilitate the process of turning this wood into a higher value resource, greater than mulch, firewood or landfill. And, in the process of salvaging these trees—usually one at a time—it requires a good amount of labor and provides valuable jobs to our local economy. We have a strong focus on tapping those workers that are the most disadvantaged. Lastly, when you utilize an urban salvaged tree that had to come down for some reason other than turning it into lumber, we offset the need to cut down trees out of our natural forests to create these same end products. 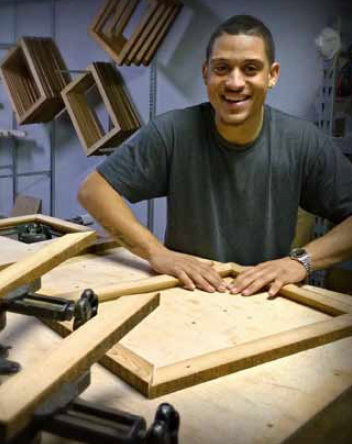 ABN: Is only the wood for your frames salvaged or are other materials reclaimed and used for your products? PH: We try to be as environmentally conscious as possible in our drive to make our products. Other reused or recycled products in our photo frames are the cardboard inserts and much of our packaging. These are salvaged from our manufacturing partner’s factory out of packaging for other goods they receive and process. Historically, they had to pay to have these disposed of or recycled. Now they are upcycled by cutting them to the various sizes needed for our cardboard inserts within our photo frames, as well as general packaging materials. In addition, we utilize recycled Detroit News and Detroit Free Press newspaper for stuffing in our shipping. Even the paper insert we use in our photo frames is made from recycled paper. ABN: You’ve mentioned your work force. It sounds like your approach there is part of the company’s mission as well. 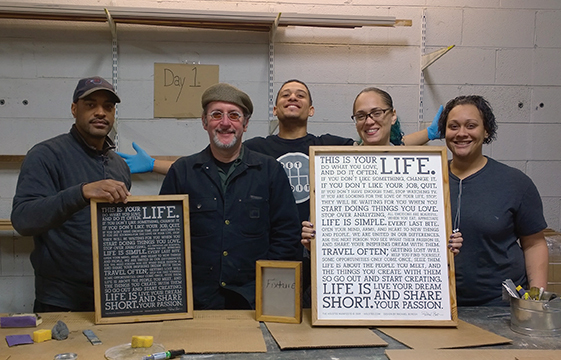 PH: From the beginning, Urban Ashes has had a focus on tapping our most disadvantaged workers. It’s part of our story. Our production crew is predominately built with people coming out of the prison system through the Michigan Prisoner Re-Entry Initiative. We want to be smart about how we utilize all of our resources, including the labor force. Providing jobs and training for disabled and transitional workers helps them, helps Southeast Michigan and Detroit, and helps the whole country be stronger. When I think about it, the most rewarding thing for me about this business has probably been the human aspect. I like to think that Urban Ashes is giving our workers something to be proud of—in some cases for the first time in their lives. That feeling to me is incredibly rewarding and powerful. ABN: What is the Detroit De-Nailed™ Collection? PH: We’ve already talked about how Urban Ashes is trying to find creative ways to keep one of America’s manufacturing hearts healthy. Over the past five years, we’ve built a formidable group of partners in the very diverse greater Detroit area. Now Urban Ashes has also partnered with three not-for-profit organizations. 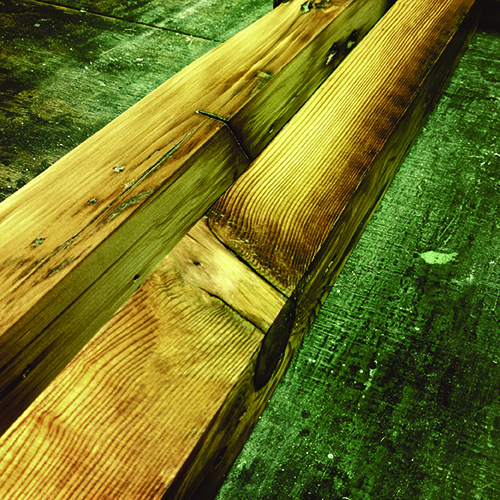 This partnership brings raw, de-nailed timbers that have been carefully deconstructed from Detroit homes, once slated for landfill, to a rich new life. With their rich histories and stories, these old-growth timbers provided shelter to families for over 100 years. While many of these homes have been bulldozed into oblivion, we are now able to rescue many of their spectacular materials by purposefully deconstructing them, then documenting the inventory. And the Urban Ashes Detroit De-Nailed Collection was “re-born” from this amazing collaboration of organizations, leadership and materials. We’re taking these wonderful rare materials and teaching our teams of disadvantaged individuals how to construct one-of-a-kind products from something that has been deconstructed. Every Detroit De-Nailed product has a tag showing the house, the year it was built and any history it may have. Now we not only make picture frames, we also offer mouldings, chop services and manufacture for other companies as well. It’s really something that is unrivaled in the framing and furnishings industries! ABN: Finally, what has the impact of Urban Ashes been on you personally, besides the long hours and hard work? PH: First, the business, the people, the company have each made me realize how fortunate I am. My personal circumstances have given me opportunities throughout my life that others simply do not have. And I know that those circumstances can change your life and your opportunities, now and in the future. At Urban Ashes, we are able to produce an enduring product that people want and that is important to me. We use milk paint or petroleum-free linseed oil in our finishes that adds beauty to the product and protects the health of our workers. Our customers tell us every day that they can see our commitment in our products, that they are beautiful, and that their customers are becoming such fans that they only want our frames and mouldings. We say we are a social enterprise. I know that is true. I feel good about where we are in the greater community and how we can contribute as we continue to grow. It all makes me a happy man!